Look: A This stick stands out from all the rest on the market. There’s nothing else that looks like it. Durability: C+ The paint has already started to chip off after only 3 games. Blade has no cracks or nicks in it. Value: B+ Even though the price tag of $219-$229 is steep, the performance of the stick is well worth it. Overall: A Although I have only used it for 3 games, I find that it has lived up to the hype and my expectations. About 3 weeks ago I broke down and purchased my first top of the line ice hockey stick. Considering how expensive sticks have become, I’ve always used the middle tier sticks. When asking pro-shop employees and other players, they’ve all said that for the once or twice a week player, a mid range stick is the way to go. They usually offer the player great performance for about 65% of the cost of the high performance sticks. In the past year or so, I have become much more confident in my ability to take slap shots in traffic and also take snap shots. 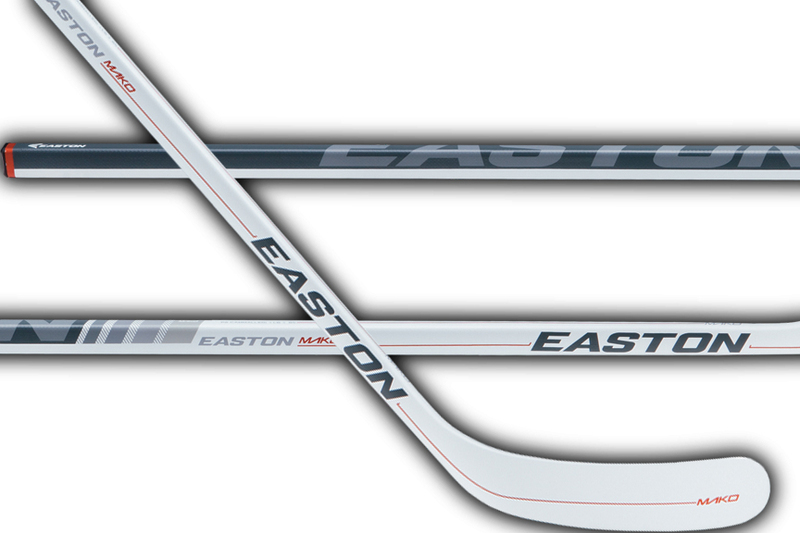 So when I was searching on the internet for the newest sticks coming out, the Easton Mako instantly caught my eye. Ever since I started playing ice hockey 10 years ago, I have only used Easton sticks. Just like with my golf clubs, I only use Titleist and Callaway. It’s just who I’m comfortable with. So when I came across this stick, the first thing that came to my mind was: Why hasn’t anyone thought of this before? For years, players have used black tape to “hide” the puck on their stick from the goalie. Many players believe that it’s harder for the goalie to pick up the puck coming off the blade of a stick that has black tape, than one with white tape. But, what if the goalie can’t see the stick? Wouldn’t that make it even tougher? Los Angeles Kings Goalie Jonathan Quick told Easton that the “black tape to hide the puck” doesn’t really matter. But to not be able to see the stick that is attached to the puck, would be completely different. When Easton first started testing the stick in real conditions, the first response they would get from the goalies was that it was kind of tough to see the stick…This is just what they were looking for. The MAKO had been out for a few days and I went scouring the internet to read some reviews. And they were all almost identical. Great feel, lightest stick I’ve ever used, perfect balance, great kickpoint. I have always used the “Iginla” blade pattern on my stick. I’ve liked it because it’s a pretty evenly curved blade. But this time I wanted to try a blade that had more of a curve at the end of the stick. When taking wrist shots I almost always shoot high. This type of blade would certainly help me get the puck up even faster. I found exactly what I was looking for and chose the “Cammalleri” blade pattern. The “Cammalleri” blade pattern has a slightly closed face and the curve is more towards the end of the blade. Now that I picked the blade I wanted, it’s time to check out how light this thing really is. It was incredible. Easton has always made some of the lightest sticks on the market, but this one was off this charts light. Even after I taped up the blade (with white tape of course) and the knob, it was still as light as can be. When I finally got it on the ice, I knew right away this was a perfect fit for me. When taking wrist shots, I could feel the puck sticking to the blade a tad bit longer than normal. This is due to the ultra-tacky non skid blade coating. If you look up close at the blade before it’s taped, it looks almost like a stucco ceiling. You can see and feel all of the bumps across the blade. This is pretty much the complete opposite of every other blade that’s ever been made. I felt the stick zipping back and forth when I was drawing the puck back, then letting it go. The pucks were actually sailing up over the crossbar at first, but I eventually get the feel for the stick and was putting the pucks in the corners. After about 10-15 wrist shots, it was time to take some slappers. Shot after shot that I took was blistered. I have always had trouble getting slap shots up off the ice. But with the MAKO, the puck rose off the ice with ease. When I really leaned into one, I could feel the stick bow and then whip off the ice as I followed through. The puck had such a great feel coming off the blade. It felt like when you hit a golf ball “pure”. The puck became “soft” and then really flew off the stick. Keith Yandle of the Phoenix Coyotes takes a wrist shot with the Easton MAKO. Just look at the flex in that stick! To be honest, I’m more of a passer than a shooter. So I was extremely happy to see the way I was able to manipulate my passes off the backhand and when saucer passing. The one negative I have to say is that through only 3 games, the paint is chipping off already. Granted, when taking 15 face-offs a game, there is going to be a lot of sick on sick contact. But the amount of paint that has come off the lower half of the stick is pretty alarming. Seems like after 10 games or so, I’m going to have a gray stick instead of a white one. I hope this review helped you in choosing a new stick. If you have any questions please feel free to leave them in the comment section below. You should try the stick WITHOUT TAPING THE BLADE!!! I did and don’t use tape on the blade with the non-skid blade coating there is way more control than tape ever provided. Maybe try it during stick time in between your games. You just may see what the Mako can really do. Sweet I just found a website selling them for 149. Think I’m gonna get it.